Light grey c/o Black Sheep Clothing striped top via ShoutPR, Gold HM necklace, Brown F21 leopard belt, Burgundy American Apparel skirt, Tan c/o Hobo The Original cross body bag, Black Comme Des Garcons sneakers. Hi there Beautifuls! I'm really happy to be back, the hiatus was due again to long long work hours and moved out all of my stuff from my Berk apartment just recently. Things have been crazy busy, but now am happy that I'm able to take more photos for ze blog. It's a balancing act and trying hardest to make sure everything gets equal love :). This outfit is a great way of transitioning from summer to spring, can you believe August is already here? times flies. Decided to make this super comfy and soft striped top from Black Sheep Clothing into a kind of dress by belting it over my AA corduroy skirt. Channeling the fall colors already, browns, reds, and grays. & keeping the comfort with my Comme des Garcons sneaks. I think for this fall I've become reacquainted with my love for sweaters (last fall, I went overboard and bought about way too many for my own good ;p). So this past weekend, had a lot of firsts, went to Dolores Park in sf, watched a free movie in the park (Sixteen Candles, ahh jake ryan lol), ate pizza from Delfina, among other really amaazing sweet things :). Hope you had a great weekend loves! Your skirt is such a beautiful color, and I always love pairing sneakers with skirts. 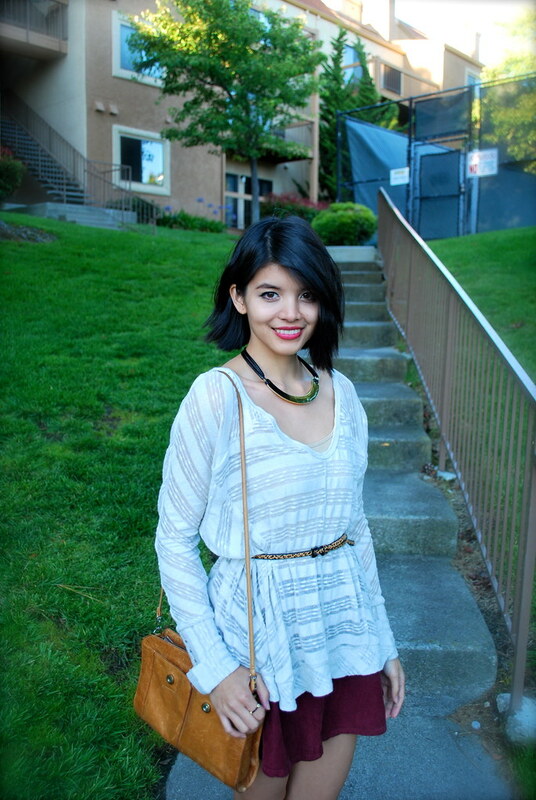 Super cute look, Kathleen! Oh how I'm super envious of your sneakers! I love how you cinched your waist styling that blouse! OMG I've been away for so long I didn't even know you had cut your hair! It looks amazing on you!!!! LOVE it!!! I also love the color of the skirt!! =D Excited for fall to come!! I love this look :) Everything goes perfectly together. Love your short hair btw. adore those sneakers!! You look so cute! And your hair is lovely! I love that you paired your outfit with sneakers! I love your necklace and skirt! happy youre back ;-) ive been stupid busy, too! awaiting our next meet up! love you, girl! looking amazing as always!! Aww yay good to see ur back too. Did u move to sf? Hope everything worked out well & looking forward to future posts! Gah i love this outfit...its really cute and quirky but also the simple shapes are gorgeous! Hi Kathleen, you are so adorable! Love your blog and your sweet personality! Now following! Feel free to check out my blog at AccordingtoKimberly.com ;) Thanks! Your look is so cute! Love the photos! You look adorable in this look! Can't stop gushing about your hair. It suits you so damn well! i really love the color combination yuo got going on! i love ur top and ur purse! KATHLEENY. I literally cannot get over how short your hair is. we used to be long hair BBFFs and now we are just regular BBFFS. hahaha. this is SUCH a fun casual summer look, ze belt is my favorite part. Looking adorable as always Kathleen! Not to sound totally crazy or anything but I read the first little paragraph of this post with a little French accent in my head. :) I blame it on you calling your blog "ze blog". Heehee. I love your awesome transitiony outfit from summer to fall. The colors are perfect for the cooler months ahead but the cuts are definitely screaming summery fun. The way you made your top into a "kind of dress" is super cute...your skirt peeks out in the cutesiest little way! 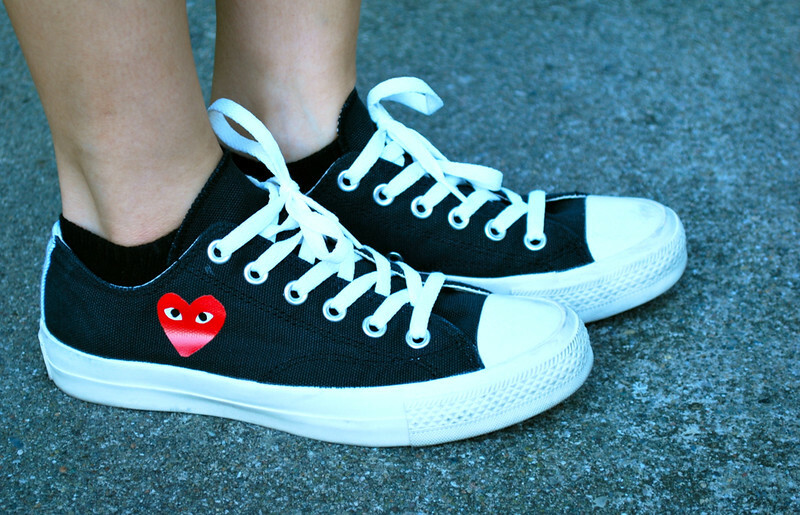 Ooooh and I love your Comme Des Garcons sneakers. All the CDG pieces are just so cheeky and awesome. good mix n match<3 love it! This outfit is soooooo cute.